Camargue horses are used to manage the feral black cattle herds in the salty marshes of the Rhône River Delta as it enters the Mediterranean Sea, says Dr Mac. 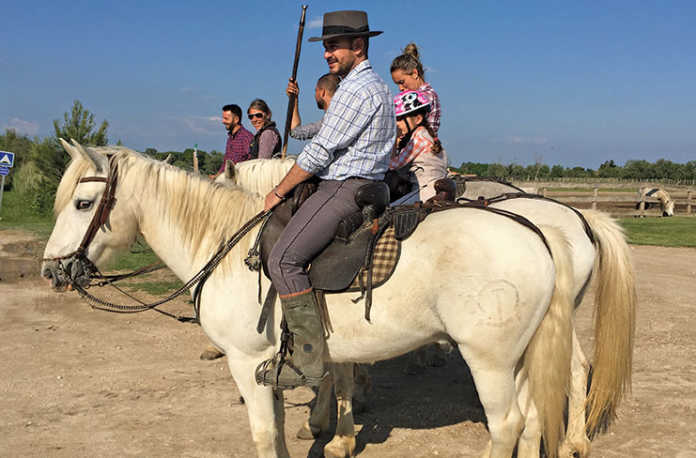 A Camargue horse with traditional saddle and bridle and rider dressed in typical ‘guardian’ riding clothes. The Camargue is the largest wetland in France and has been home to Camargue horses and wild black cattle for many centuries. Some suggest that the horses trace back to the prehistoric Solutré horses depicted in cave paintings in Europe. Traditionally, both horses and cattle live in semi-feral, extensively managed herds in the salt marshes of the Rhône River Delta, close to the city of Montpellier. Camargue horses are very hardy, small (only about 13hh to 14hh), stocky and always grey, although they are born black or brown. Their hooves are large and only the working horses that take part in parades and tourist activities are shod. In summer, Camargue horses eat shoots, reeds and indigenous plants like samphire and saltwort, while in winter they survive on dried grass and goosefoot. They enjoy going through salt water and are often pictured galloping in the breakers along the beach, as described in Roy Campbell’s epic poem, ‘Horses on the Camargue’. Able to travel long distances and survive violent weather conditions, Camargue horses are traditionally ridden by ‘guardians’. These riders have a simple lifestyle, living in windowless, thatched cottages. In addition to using horses daily in the marshes to manage the cattle herds, they celebrate various festivals involving both horses and cattle. The saddles they use have a high cantle and pommel, and the bridle includes a chain noseband, but no throatlatch. The horses are trained to neck-rein one-handed, as riders carry a lance with a trident at the end that they use to handle the cattle. Foals are weaned at 12 months and branded. Colts are gelded TALKand broken in at between two and three years old. Mares are not generally ridden, but used only for breeding. The breed was recognised in 1978 and only horses bred in the Camargue region can be entered in the National Stud Book by the Breeders’ Association (Association des Eleveurs de Chevaux de Race Camargue). The black Camargue cattle are not domesticated and also roam the marshes, although they are branded and cows are kept in herds with a selected breeding bull. The bulls are built delicately, unlike the bulky domestic cattle we see elsewhere in the world. All are black and have long, sharp, lyre-shaped horns. They are bred mainly for bull running (Course Camarguaise). The names of the bulls and the farm where each was bred are very important, as the best bulls can earn their owners a lot of money for a few minutes in the ring. The sport takes place in a sand arena and each bull has a small red rosette tied between its horns. A single bull is pitted against a group of white-clad athletes who get the bull to chase them, then dodge past it, or leap over it, to take the rosette. Sometimes the athlete gets too close and is tossed by the bull; sometimes a bull jumps the fence and causes consternation among the spectators. The meat of Camargue cattle has become a regional delicacy. The flavour and consistency are more similar to springbok venison than to beef. For more information, watch this video below.